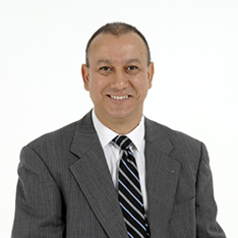 After gaining a BSc in Civil Engineering from the Tunis Advanced School of Science and Technology, Tunisia, Dr Achour worked in private engineering and design firms on designing structures and training engineers in several countries. Granted a Japanese Government Scholarship to further his education, he gained his MSc with a focus on the response of hospital lifeline systems following seismic activities and his PhD on hospital’s fragility assessment in 2004 and 2007 respectively from Kanazawa University. Following his graduation he was then employed as a Post-doctoral Researcher in his graduate University. He joined Loughborough University in September 2007 as a Research Associate. He coordinated the research activities of the £11million HaCIRIC research centre, and the CPM WBDL MSc Course. He was awarded the Best Paper Award during the CIB World Congress 2010, and the Highly Commended Paper in the 2016 and 2015 Emerald Literati Network Awards for Excellence. Nebil is actively involved in national and international research and consultancy activities and interested in exchanging knowledge with academics and practitioners, specifically those working on similar topics.